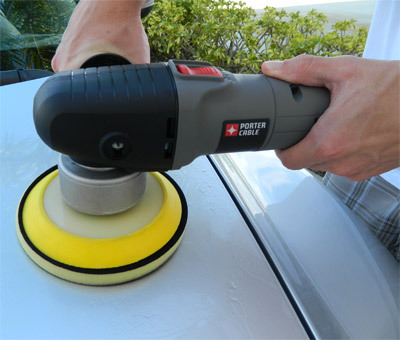 The perfect solution for paint decontamination – with your dual action polisher! The Nanoskin Autoscrub System is a fast, effective way to remove above surface paint contaminants with your dual action polisher. The Nanoskin Autoscrub System utilizes advanced rubber polymer technology to safely remove above surface paint contaminants like paint overspray and rail dust. This unique material is becoming widely used in the car care industry for paint decontamination, but Nanoskin has pioneered the machine application of this technology with the Autoscrub System. The medium grade Autoscrub System is perfect for professional detailers who encounter vehicles with moderate to heavy paint contaminants. Use the Autoscrub System with an approved lubricant, like Nanoskin Shock or Glide. Spray the face of the pad and the actual panel that you're going to be working on. Only work on one panel at a time. Set the polisher on a low speed setting and move the polisher back and forth and then side to side. Do NOT apply any pressure to the polisher. Inspect the paint often using your hand placed in a plastic baggy. When the paint feels smooth, wipe off the lubricant and move on to the next section. Most professional detailers and car care enthusiasts agree that claying is the most tedious step in detailing. It is messy, time consuming, and you don’t always achieve the smooth finish that you desire. Plus, if you drop a clay bar on the ground, you must discard it or you risk the chance of scratching or marring the finish. The Nanoskin Autoscrub System replaces detailing clay and the hassle that goes along with it by utilizing a machine-applied disk laminated with a high-tech rubber polymer face that effortlessly removes paint contaminants leaving you with a smooth finish that’s ready for polishing. Like any other profession, time is money when it comes to production detailing. The sooner you finish a vehicle, the sooner you can get started on another one. The Nanoskin Autoscrub System practically eliminates paint decontamination which is one of the most time consuming, labor intensive steps. By utilizing the power of your dual action polisher, the Nanoskin Autoscrub System removes all types of paint contaminants including rail dust, paint over spray, industrial fall out, bugs and even tar. What’s more, it can even be used on glass, chrome, and exterior trim. The Nanoskin Autoscrub System is so easy to use anyone can do it! Just because this system was designed for the professional doesn’t mean the beginner can’t take advantage of the many benefits it has to offer. Simply use an approved lubricant, like Nanoskin Glide or Nanoskin Shock. Spray a liberal amount on the surface and turn the polisher on with the Autoscrub System attached. Make a few passes over each area and then inspect your work. If you accidentally drop the Autoscrub System on the ground, simply rinse it off with water. 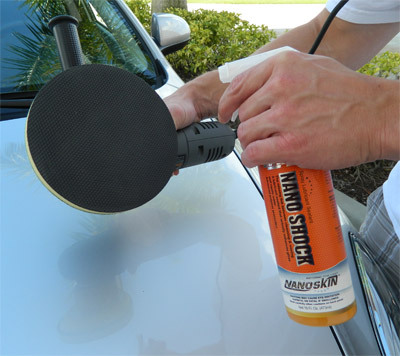 The Nanoskin Autoscrub System revolutionized paint decontamination and you’ll quickly appreciate its ease of use every time you use it. Note: This is the MEDIUM GRADE version of the Autoscrub System. It is designed for vehicles with moderate to heavy contaminants. To achieve flawless paint when you’re finished using the Autoscrub System, we recommend following up with a fine polish like Pinnacle Advanced Finishing Polish and a polishing pad on your dual action polisher. Nanoskin Autoscrub Fine Foam Pad – 6 inchNanoskin Autoscrub Fine Foam Pad 4 inch – 2 PackNanoskin Autoscrub Medium Foam Pad 4 inch – 2 PackNanoskin AutoScrub Fine Grade Wash MittNanoskin AutoScrub Medium Grade Wash MittNanoskin Autoscrub Towel – Fine GradeNanoskin Autoscrub Towel – Medium GradeNanoskin Autoscrub Handy TowelNanoskin Autoscrub Speedy Prep Sponge – Fine GradeNanoskin Autoscrub Speedy Prep Sponge – Medium GradeNanoskin Autoscrub Speedy Prep Sponge Combo PackNanoskin Brilliant Shine Autoscrub KitNanoskin Autoscrub Speedy Prep PRO Starter KitNanoskin Autoscrub Towel PRO Starter Kit – Fine GradeNanoskin Autoscrub 6 Inch PRO Starter Kit – Fine GradeNanoskin Autoscrub 6 Inch PRO Starter Kit – Medium GradeNanoskin Autoscrub Wash Mitt PRO Starter Kit – Fine GradeNanoskin Bubble Bath Wash & Shine Shampoo 16 oz.Nanoskin Glide Instant Detail Spray Lubricant Concentrate 16 oz.Nanoskin Glide Instant Detail Spray Lubricant Concentrate 128 oz. Tackled six cars with white paint overspray using this Autoscrub medium foam pad and a Griot's DA polisher. Needed to make several passes, and touch up tight areas with clay, but overall I'm extremely pleased with this product. Be sure to use plenty of lubricant. I'll be purchasing the fine grade foam pad soon for normal paint decontamination. Great product, highly recommended! I used it for the first time and it did save me time compared to a traditional clay bar. Pros its for machine use so you save time w/out the effort that a clay bar takes. seemed difficult to use on curved panels hard to use in smaller areas. This thing cut right through tough overspray like it was nothing! Used it with a 10:1 ratio of DG rinseless and it left a nice slick finish with no marring! Did 7 cars today in less time than it took us to do 6 yesterday with conventional clay bars which marred the finishes. Used it on the paint and glass. Saved us a heck of a lot of rubbing. Another innovative product that makes me giggle when I use it. ProsA huge timesaver when dealing with overspray. No more rubbing! Worth every cent, the Autoscrubber works just as it's say. Broke it in on the windshield and went on the to the paint of the truck. Very easy to use and does as they say. I got the 6" pad, and it works great and quick, but it works best on larger flat panels. I think the 4" would definitely work better for the cars I work on.